I’m currently struggling with carpal tunnel, which is hard because typing is, well, a big part of my job. Luckily it’s my left hand so cutting and stirring isn’t unbearable. 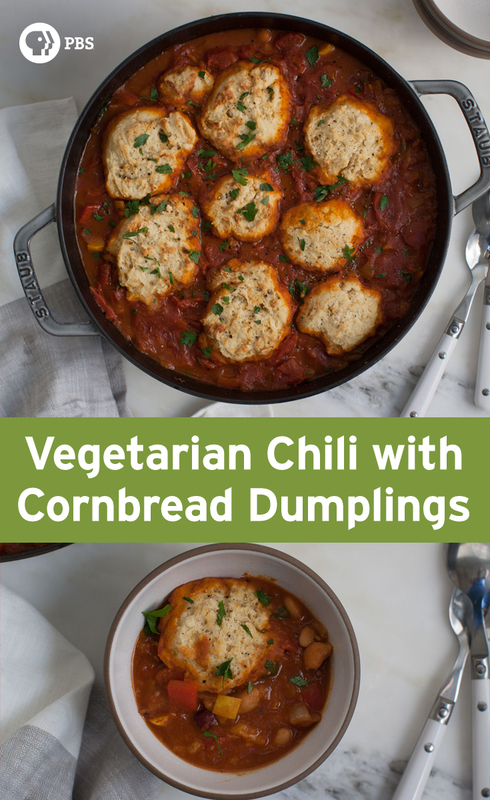 Because of my strange injury–which hopefully will go away soon—coupled with the fact that chili truly is what I love to eat regularly during fall, I bring you this fall! I love chili of all kinds, but the one I love to make at most at home has no meat in it and is strictly vegetarian. 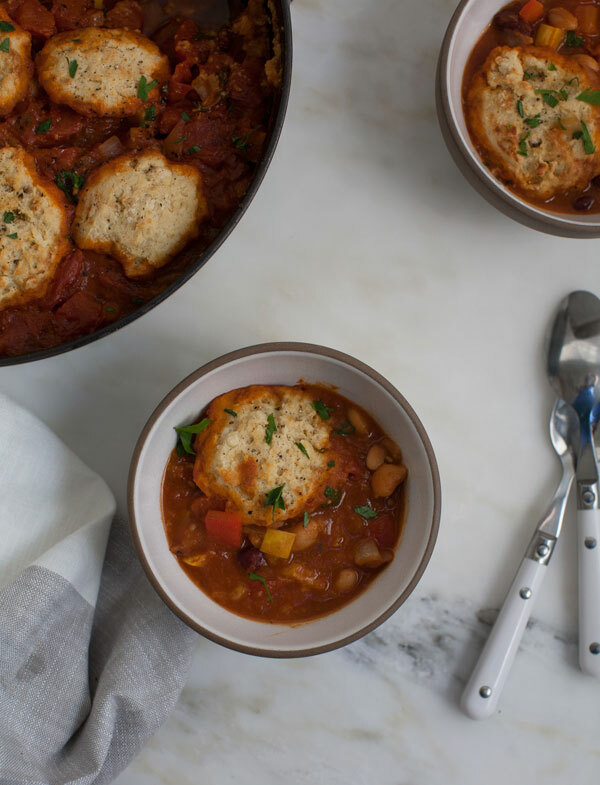 It makes for a very light-feeling chili that won’t way you down, all the while being super hearty and filling. 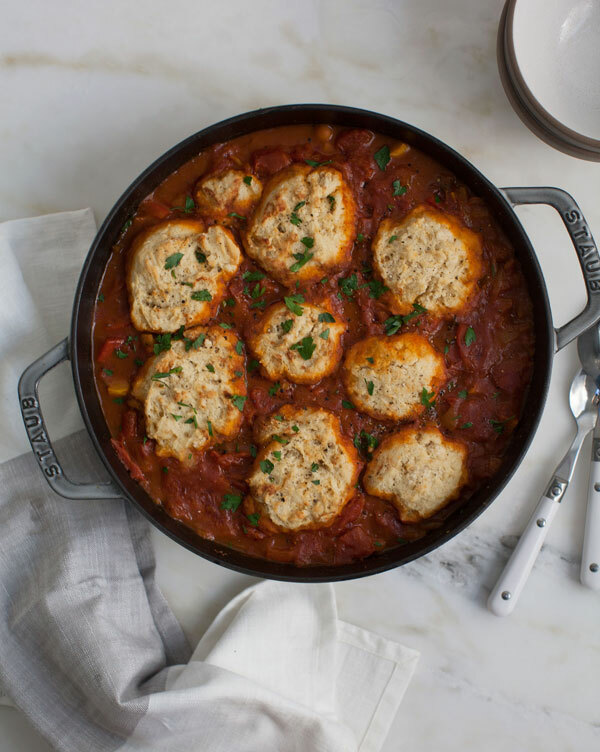 I wanted it to be a cross between a savory cobbler and dumplings, so I added a bit of cornbread dumpling dough on top. Another option is to completely skip the dumplings and just make the chili—it’s just as good! Another thing that I love about this dish is that it’s FAST. Very fast. It’s the type of dish you make on a weeknight when food has to hit bowls in 30 minutes flat. I’m usually not the speediest of cooks but I love to make a big batch of this and reheat it throughout the week. In a medium pot, set over medium heat, add the olive oil. When warm, add the diced, red bell pepper, delicata squash, jalapeño pepper and cook until softened, about 5 to 7 minutes. Mix in the minced garlic, cumin, oregano, paprika, cayenne and cook until fragrant, about 1 minute. 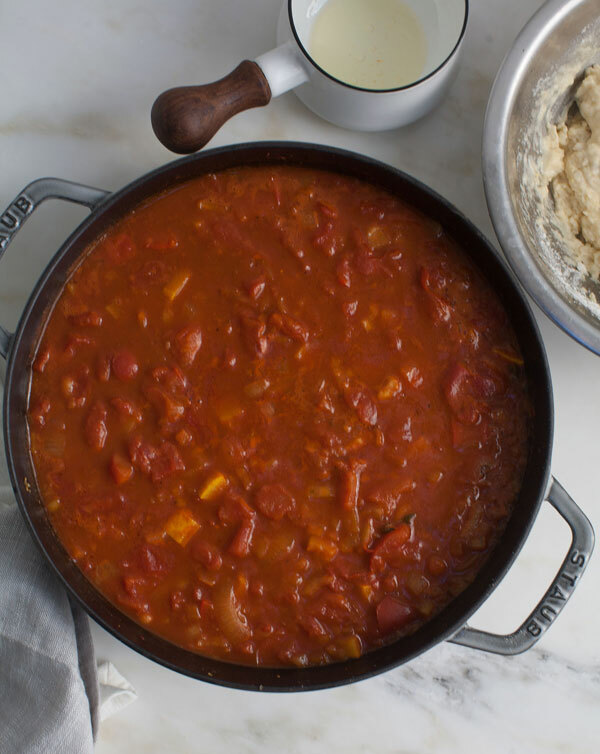 Pour in the crushed tomatoes, vegetable stock, cannellini beans and kidney beans. Bring to a simmer and then immediately turn heat down and simmer for about 10 to 15 minutes. Stir in salt to taste. I ended up adding about 1 1/2 teaspoons of salt. Preheat the oven to 350 degrees F. Meanwhile, in a medium bowl, whisk together the corn flour or cornmeal, all-purpose flour, baking soda and salt. In a measuring up, measure out the buttermilk and whisk in the melted butter and egg. Pour the wet ingredients into the dry and mix until barely combined. 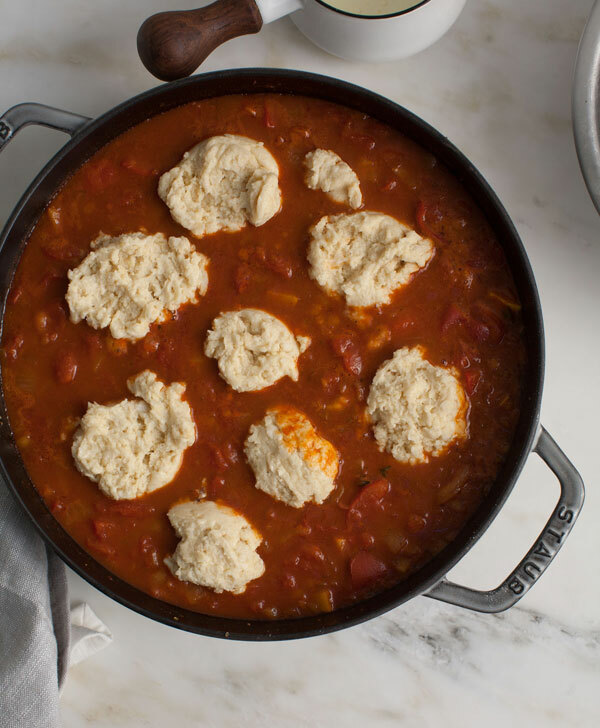 Drop scoops of the dough onto the surface of the chili and transfer to the oven to cook for about 15 minutes, until the top of the dumplings are lightly golden brown. Divide amongst bowls and garnish with minced parsley and a few turns of freshly ground pepper. Note: If you’re not adverse to heat, you can use half of a jalapeno.